The company introduces precooked potatoes to the market in different variations with herbs and sauces, for example to make gratins. Peka Kroef has a large retail market share in the Benelux market. The Food Service Division is active throughout Europe and has a substantial part of that market. Products required different regimes in the autoclave, which is why a new plant was built with eight, smaller autoclaves. 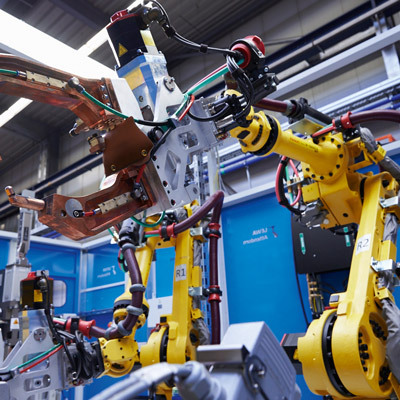 The loading of these autoclaves is fully automated, since several FANUC robots simultaneously work together to manage the complex routing of the products. The system now provide high flexibility to diversify their product offering, while the robots deliver substantial cost savings because their handling, in the old setup, took five operators in five shifts. Furthermore, the system contributes to a comprehensive tracking since the robots never make mistakes and ensure that each product gets to the correct autoclave. Peka Kroef is a Dutch family business specializing in fresh potato products. The company introduces precooked potatoes to the market in different variations with herbs and sauces, for example to make gratins. Peka Kroef has a large retail market share in the Benelux market. The Food Service Division is active throughout Europe and has a substantial part of that market. That’s a lot of potatoes. The Peka Kroef plant is located within rural Odiliapeel, in the middle of the fields. “We are active in the whole chain”, explains Frans Habraken, corporate engineering & maintenance manager. “We supply the seedlings, guide the growers and have a complete in-house production, from washing to peeling, blanching and cutting to packaging." A lot of the products undergo a sterilization process after being packed in an autoclave at 120 °C. Until recently, in fact, Peka Kroef had the largest autoclave ever built for the food industry. The Jumbo 1 of the French manufacturer Lagarde could hold 9 tonnes of products in one run. The plant was built by the Danish firm Jorgensen Engineering, an integrator which specializes in these types of applications. The FANUC robots were chosen in mutual consultation because of their high reliability, among other things. “The installation runs 24 hours a day,” explains Frans Habraken. “It is a relatively complex routing which necessitates us having a complete tracking of the path that the products take. That is no longer feasible manually, so if the robots failed, the whole production would grind to a halt. That is why we have chosen a well-known manufacturer. We have also made prior arrangements concerning servicing and the availability of spare parts. Should there ever be a failure, we need to know that we can be helped quickly." It is not only the routing of products that is complex. The robots are also situated in each other’s work area and carry out nice, synchronized actions where one robot puts down new plates that are then filled by the second robot with products. The robots have fairly large tools that were engineered specifically by the integrator to accommodate a wide range of packaging. All this makes the application delicate, however, and the risk of collisions is not entirely excluded. Shortly after the commissioning of the installation, Peka Kroef already experienced the importance of a good service contract. “At FANUC Benelux we have a service contract with annual service and the possibility of calling a technician 24 hours a day,” said maintenance manager Roland van den Heuvel. “Shortly after commissioning we had a collision with one of the robots”. The FANUC technician was on the spot quickly. Our people also had been able to forward a few pictures so that the technician could bring the right parts immediately. That personal approach to service is just as important as the reliability of the machines themselves”. Peka Kroef has a contract for telephone & technical support with a guaranteed response time of less than 4 hours. A team of six people also followed a 4-day training seminar on the operation of the robots at FANUC in Mechelen. “That was pretty interesting and very instructive", says Roland van den Heuvel. “Every participant gets to work with their own robot” So it is not possible for you to hide. A few days later we had a situation where the robot was in a position whereby the program could not continue. The operator was then able to take over control and move the robot by the shaft so that the program could continue. Training is also an important addition to the service for us. If there is a problem which we have to rely on the people of FANUC for, it is important that we have sufficient knowledge to be able to understand the robotic operation and analyse what exactly goes wrong. " The plant has been operational since the end of 2015. The robots work 24 hours a day conveying products to and from the autoclaves. The system has given Peka Kroef the flexibility to continue striving for a diversified product offering. At the same time the robots deliver substantial cost savings because their handling, in the old setup, took five operators in five shifts. The system also contributes to a comprehensive tracking because the robots never make mistakes and ensure that each product gets to the correct autoclave.